Coming out of university I’m encountering a world where people are having to re-evaluate how and where they spend their money. Do we want mass produced things, or would we rather take the time to search for a piece that means something to us? After the 2008 recession, Europeans began looking for that “something else.” Supporting local business became important, as well as the idea of recycle, reuse, and do-it-yourself projects. People were seeking a simpler life. A back to nature, back to basics, with weathered greyed colour, raw woods, and hammered metals. 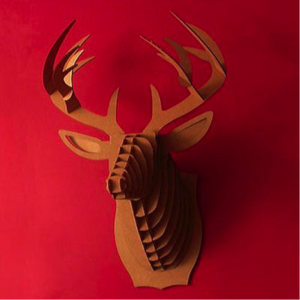 A rustic look, one that has been labelled the Hunter Gatherer. This trend is being quickly embraced in North America as we seek out similar values. 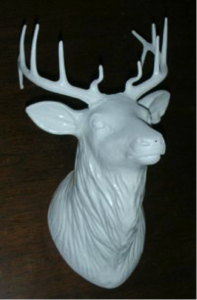 Most of the pieces that fit into this genre represent nature in a big way. 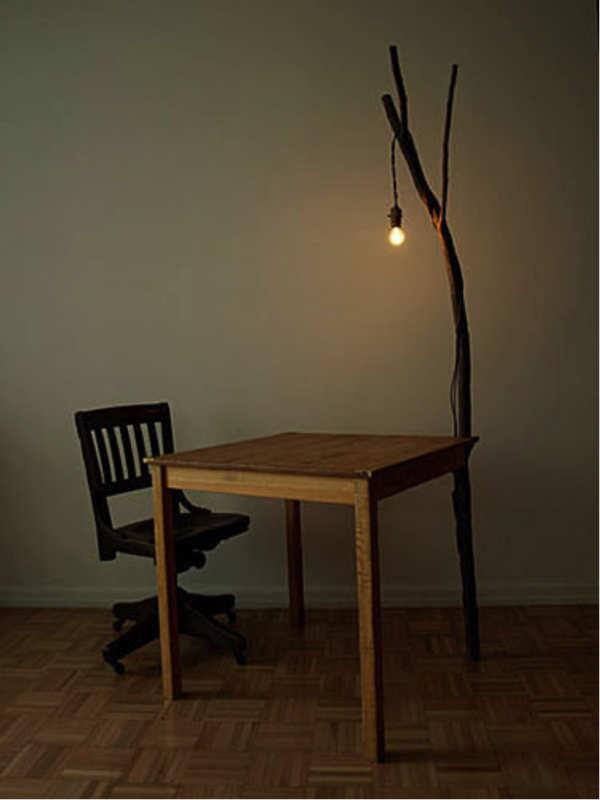 This table uses a branch as one of it’s legs, as well as to hold up a simple light. 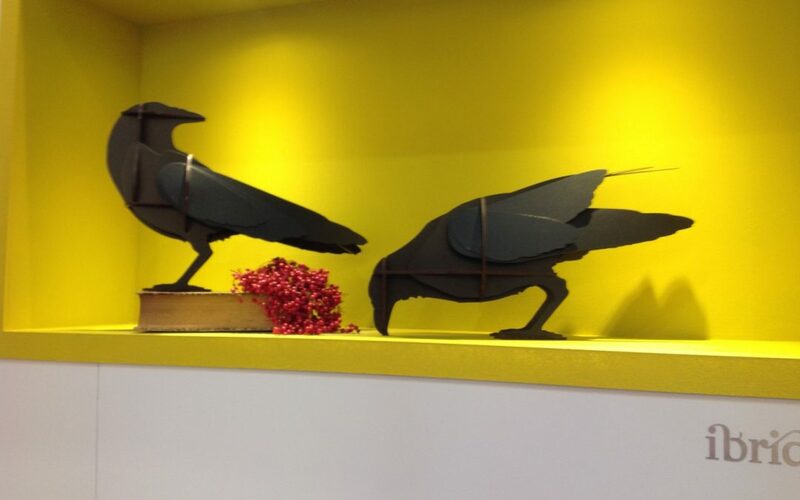 My Mom took this picture at Wanted Design in New York. 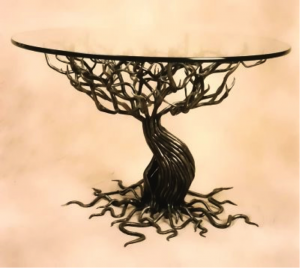 This table takes a different approach by mimicking nature and using cast metal instead of real wood. 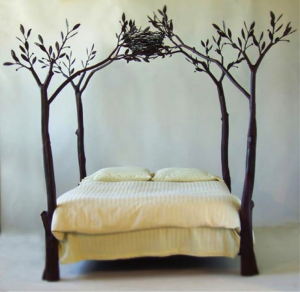 Shawn Lovell of Oakland California crafted these beds. They give a woodland setting and bring the outside in. 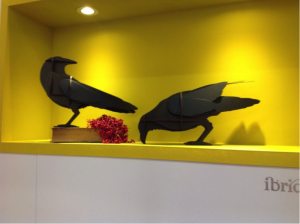 Here nature takes the place of every day objects, and provides a practical purpose inside the house. The stump of the vine becomes a newel post, with the roots securing it to the step. 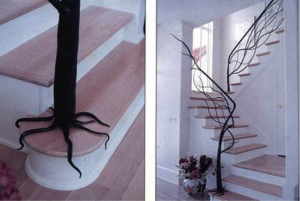 The rest of the vine becomes the railing, giving a whimsical airy, individualistic feel to an everyday staircase. 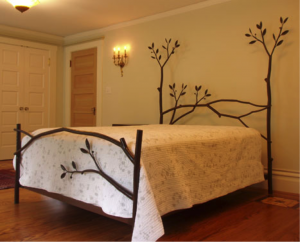 This light on the wall mimics a branch and brings new meaning to sconce. 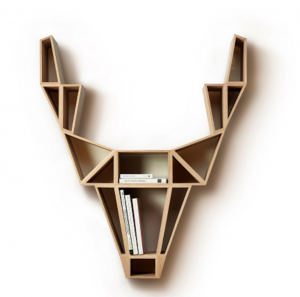 The iconic deer head becomes the vehicle for modern materials and ideas. The cardboard head is recycled paper, the white head is made of a poly resin. 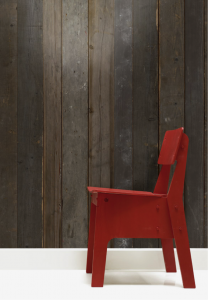 Weathered furniture and weathered walls also fit into this trend. 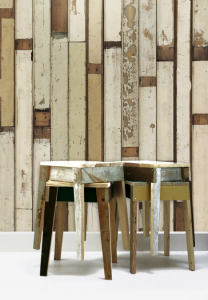 Such as this Scrap Wood Wallpaper by Peit Hein Eek Wallpaper. You have to touch it to realize it is not real. The gray in the wallpaper makes that rusty red chair pop. These are some of the colours of the Hunter Gatherer trend. This trend represents a return to our roots. It shows a support of fine workmanship. The individual isn’t looking for the manufactured, off-the-line IKEA look any more, but will use IKEA to fill in the gaps. Or they will repurpose Ikea items to blend them in. No one can deny that when it comes to Ikea …. the price is right. And they continue to lead the market in green practices and designer supported ideas. But at the same time we want something different, unique. The kind of thing you scour through a flea market to find, or something from a local artisan. We aren’t hunter gatherers in the traditional sense any more but we can hunt for and gather together our own unique style. To find your own style let us help. Call at 416-577-4944 or email Roz at roz@rozmorgandesign.com.